It’s high summer and those of us who aren’t would probably like to be at a cottage. This cottage is in Rondeau Provincial Park, on Lake Erie south-east of Chatham, Ontario. 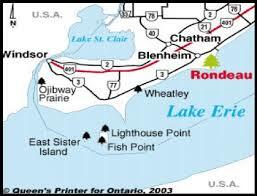 Rondeau is a big sand spit jutting into the lake creating a circular — ronde eau — bay (actually more egg-shaped). From the start cottages were a key component — they provided seasonal accommodation for families and their leases created income to help make the park self-sufficient. 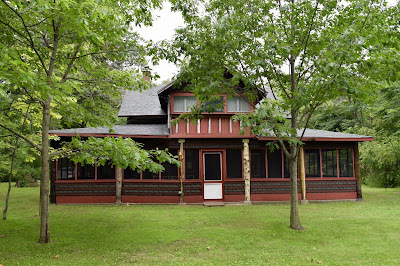 The first cottages at Rondeau date from the 1890s and they continued to be built through the first half of the twentieth century with the number of cottages peaking at about 450 in the 1950s. The province stopped approving new cottages and over time, as cottages came up for sale, began buying them… and demolishing them. From 451 the number of cottages has fallen to 283 (and counting — down). Cottage lot leases, customarily for 21 years and renewable, were last renewed in 1996, without the renewable clause. All of the remaining leases are due to expire in less than a year and a half… on December 31, 2017. Needless to say, the cottagers, many of whose families have been at Rondeau for generations, are not happy with the situation. The Rondeau Cottagers Association (RCA) strenuously opposes the removal of cottages and the potential end of the 125 year-old cottage community at Rondeau. While the plan acknowledges the importance of cultural and historic resources in the park, they are clearly of secondary interest. For example, although a key provincial parks objective is “to protect provincially significant elements of the natural and cultural landscape of Ontario”, under this heading the plan discusses only natural features of the park. The plan does say: “A cultural heritage resources management strategy will be prepared to guide exploration, preservation and utilization of Rondeau’s cultural resources.” But after 25 years there is no evidence this strategy has ever been done. And no indication the now outdated plan is being revised. There is little doubt the cottages issue is holding things up. Not content with listing the park under the OHA, C-K proceeds to study the park for potential designation as a heritage conservation district under Part V of the Act. (Note 5) That moves forward to the preparation of an HCD plan. Then, in October of last year, the municipality — in a move both admirable and audacious — designates the built-up area of the park as an HCD. Well, you know what that would do… demolition or removal of cottages, not so fast! To all this — including public meetings on the proposed HCD — the park’s owner, MNRF, could not have been oblivious; but it seems the passage of the designation by-law was what finally prompted a response. 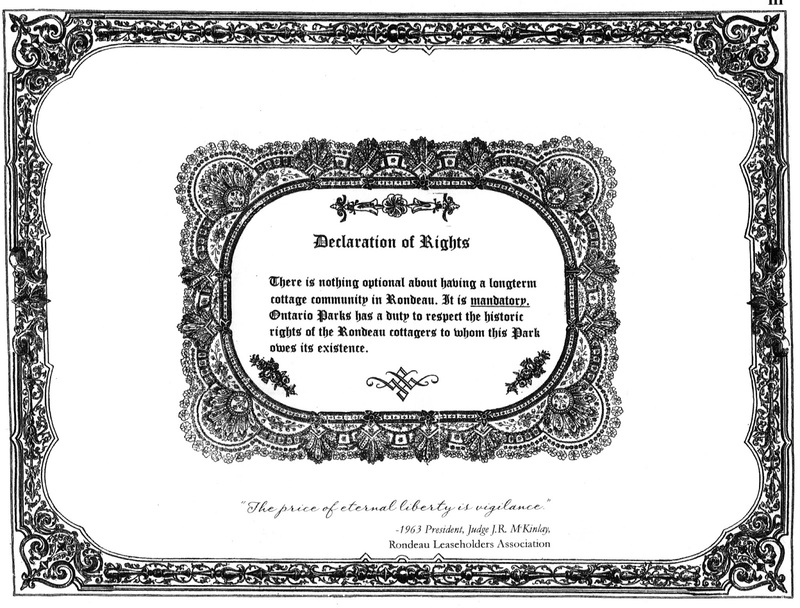 They appealed… and last month the Ontario Municipal Board came to Chatham. Protect significant natural and cultural features in the province while supporting Ontario’s economy. Regulated under the Provincial Parks and Conservation Reserves Act, they are important for outdoor recreation, scientific research and environmental monitoring, and education. Protect significant natural and cultural features while providing opportunities for a variety of compatible traditional activities (e.g. fishing, hunting, trapping). Regulated under the Provincial Parks and Conservation Reserves Act, they are also important for scientific research and environmental monitoring. 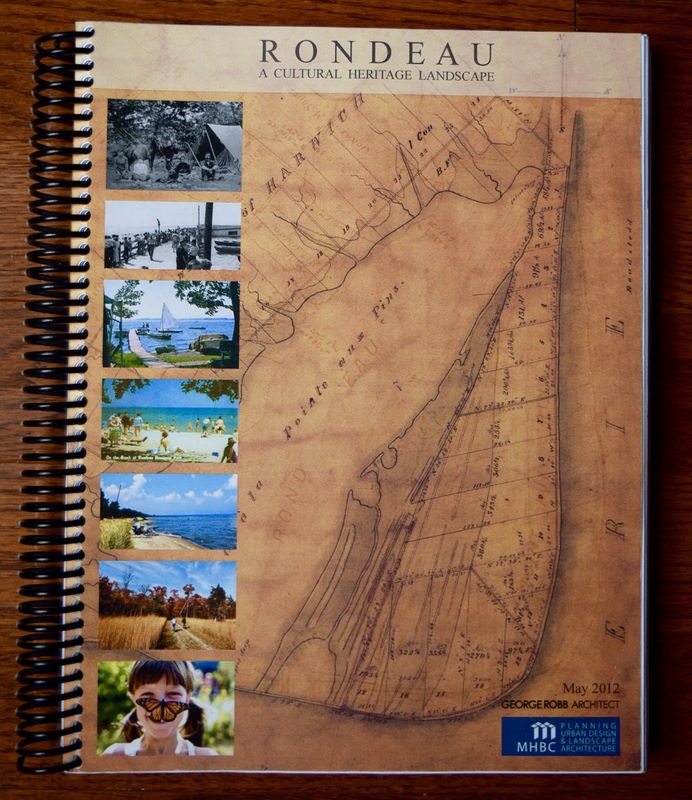 Note 2: The situation at Rondeau has some parallels with that of Toronto Island. There the decades-long wrangling over the future of the island cottage community was only finally settled with the passage of special legislation, the Toronto Islands Residential Community Stewardship Act, 1993. There's also been an issue with cottages in Algonquin Park, but there the cottages are scattered throughout the park, while at the much smaller Rondeau they form a village-like community.